This darling snowman and snowwoman make the perfect couple. 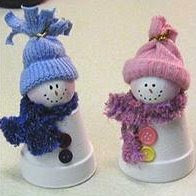 All bundled up for a cold winter's day, and so easy, the kids can make them too! Tie a strip of material or mitten scrap around the neck to fashion a scarf. Glue in place if desired. Glue two buttons to the front of your snowman. With black fine tip marker, dot on eyes and mouth. Use a small paintbrush to apply orange paint for a nose and gently dab on a thin amount of pink for the cheeks.